A number of photos received from actor Graham Hoadly (UK). The photo is of his Grandfather and Great Uncle taken in Peckham in the mid 1900s. He also attached a photo of his Grandfather tinkering with an engine and wondered if it is the same car. We can confirm that it is the same and that it is a cca 1904 Clement, probably 7HP. The Clement scuttle can be recognised by having a handle on the scuttle bonnet. The registration A 3013 was issued by London County Council, late 1904. Photo received from Dennis Harrison (UK) who thinks it is of a Rover. 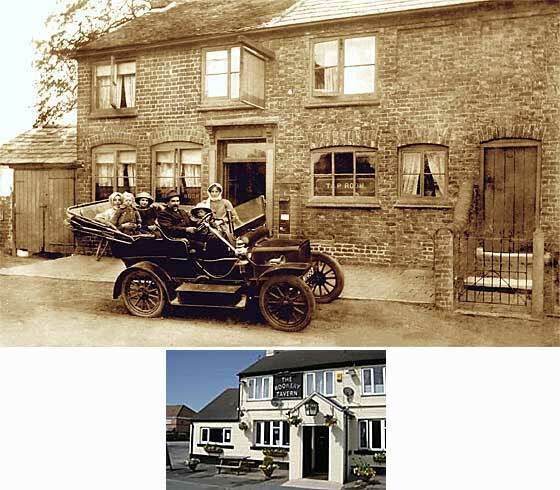 The car is in front of the Rookery Tavern, Ettiley Heath, Sandbach Cheshire, and holds his great Grandad (driver and pub owner), Grandma, and his father. The photo was taken in the early part of 1913. Very evocative of the period. 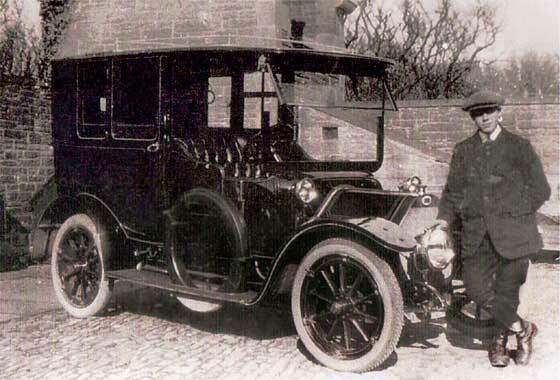 The Registration M 1493 was issued by Chester County Council in early 1907. The car is indeed a Rover. Having no dumb-irons defines it as a cca 1907 Rover 8, body Four Seat Tourer. 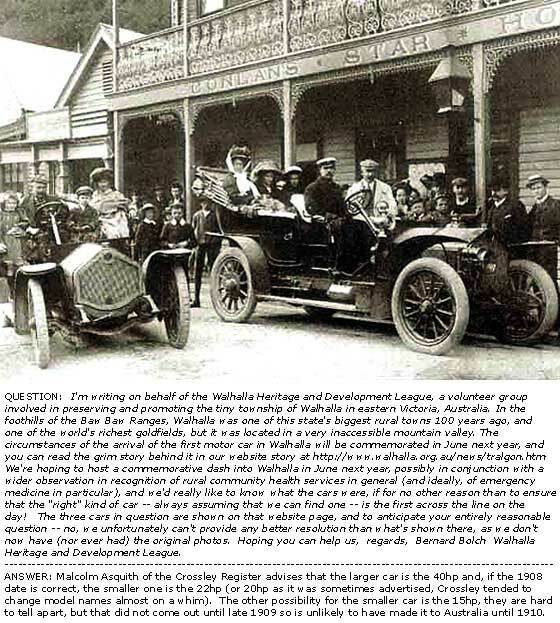 Two photos received from Bernard Bolch of the Walhalla Heritage and Development League (Australia) who are preparing to commemorate the arrival of the first motor car into what was one of the world's richest goldfields in the inaccessible foothills of the Baw Baw Mountains. This is the second photo, confirmed by Malcolm Asquith of the Crossley Register as, the larger car being a cca 1907 Crossley 40HP, the smaller being a Crossley 22HP (20hp as was sometimes advertised). A number of photos received from actor Graham Hoadly (UK). This photo is of his Uncle Len Hoadly in an unidentified car. 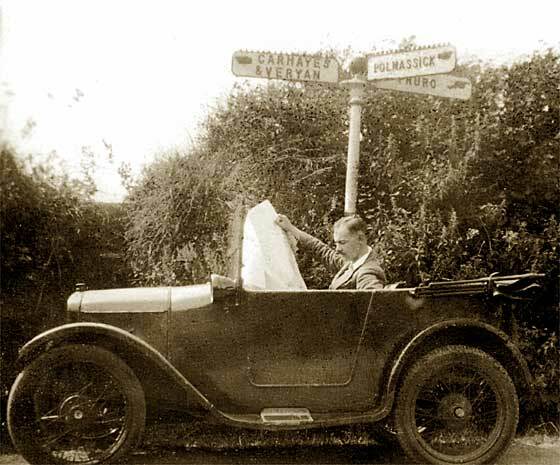 Len was a driver for the post office before WW1, and also drove during the war. Afterwards he worked as a pastry cook. Len loved cars, and was a better driver than his father, who once knocked a milk cart over on Brixton Hill ! Mother would only travel by car if Len was driving. 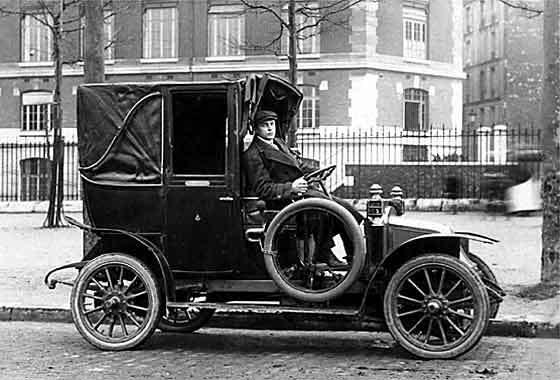 The car is cca 1909 Humber, 12 or 15HP. Registration was issued by London CC. Enquiry received from Ben McKenzie (UK), a postcard collector, trying to identify this vehicle from a recent acquisition. " It looks similar to the Belsize Landaulet Taxi on your site. What an excellent web site you have providing much needed reference material for generations to come." Thanks for your compliments. Unfortunately we got no further response. General consensus has it as a cca 1911 Unic Landaulette Taxi. Unic Taxis were made in France and much used in London for years. One of two photos received from Gene Maurey (USA) saying he would love to know what kind of cars are shown on the two French postcards. 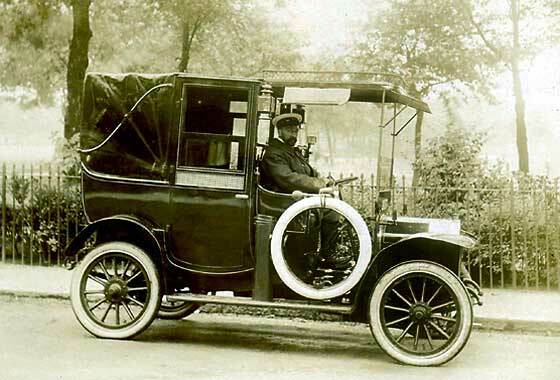 The first one is relatively easy as it shows a cca 1911 Renault AG Taxi. These were made between 1904 and 14, and are frequently referred to as the "Renault AG Landaulette Taxi de la Marne" because in 1914 Paris taxis were requisitioned to take French troops to the battlefront at Marne 100km from Paris, and moved over 5000 troops over three days. Another of the photos received from Christopher Bond (UK) which could not be identified by our usual experts. 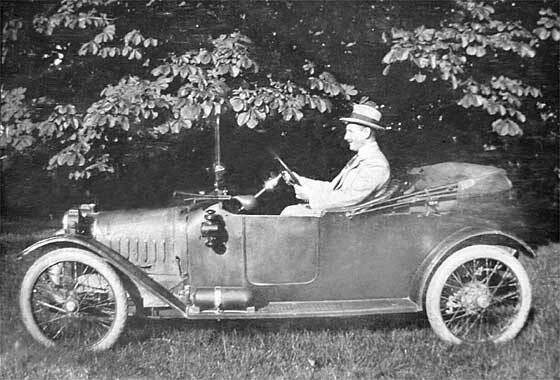 The car is a cca 1912 Detroit Electric. Detroits had curved solid fronts and were intended for women. Seems that for one year they had a dummy rad and were a 'Gentleman's car'. Badge is not the normal 'lightning' type. Detroits were also made in Scotland by Arrol Johnson with scuttle bonnets. Numberplate is Birmingham CBC of approx 1917, about four years later. 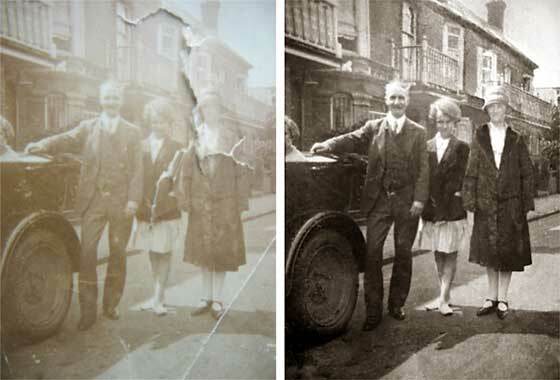 Lovely photo received from Connie Dunnett (UK) trying to find out the make of a car in a photograph that her father found. He used to be an RAC patrolman and thought he should be able to recognise the shape of car. It would make an old man very happy if you could help. Initial thought was that it is a Lancia but our Tim Harding is relatively sure it is a FIAT. 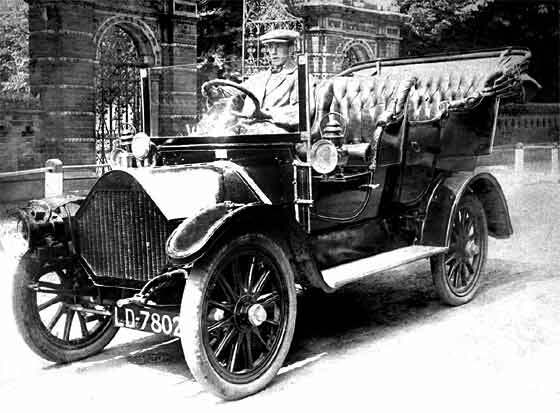 If so, then a pre cca 1912 FIAT Tippo Due with a straight and more flat bonnet. Cannot go by body shape as this would be by others. One of three photos received from Christopher Bond (UK). All he knows about them is that his father and an uncle owned the cars, guess about 1915? All three photos gave us problems! This one carries a Birmingham County Borough Council registration issued early 1913. The car is shown in both an open tourer and interesting 'hardtop' version. The latter appears to carry WW1 light masks. The badge, used only briefly, confused but we are pretty sure that it is a cca1913 Mercedes Simplex. Enquiry received from Eskil van Loosdrecht (Sweden) saying this is a photo of his Grandfather taken around 1920 in Kallinge, Sweden. He contacted Peugeot in France but they only had the Quadrillete around that time. This is in fact an American car, a cca1914 Woods Mobilette, claimed as first US cyclecar. Made initially in Chicago, it was less than 1m wide, staggered tandem seats for two, water cooled 4 cylinder, 2 speed epicyclic box, capable of 35mph. 1000 per month made in 1914. Enquiry received from Monika saying: " This is is the BEST website I have ever seen! Neat, organized, beautifully maintained !... Maybe you could help me... I am looking for a photograph of an Austro Daimler Phaeton from about 1915-1919. My great grandmother lived in Austria, and this was her family car." The Phaeton was an early name for a Tourer, a car where the roof comes down completely. 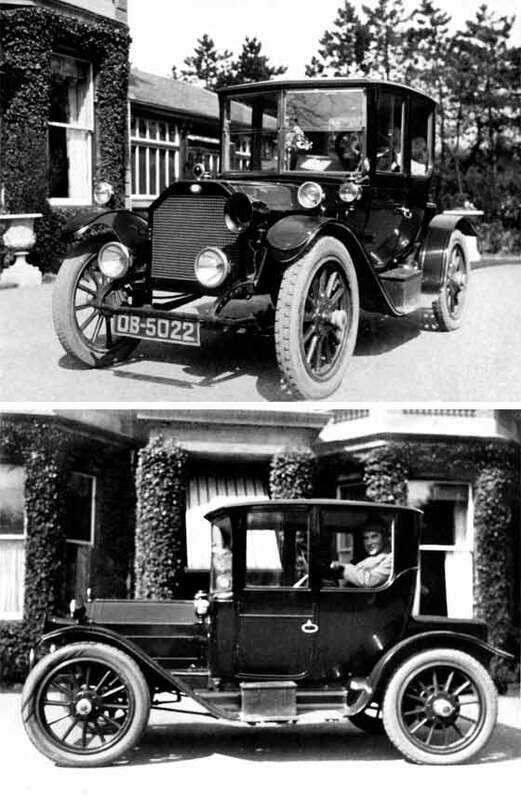 The body style and the radiator both changed during the period, so both are shown. Two photos received from Martin Lund from Copenhagen (Denmark) who is in the final stages of a book about the Royal Danish household cars through 100 years. Two he cannot identify. 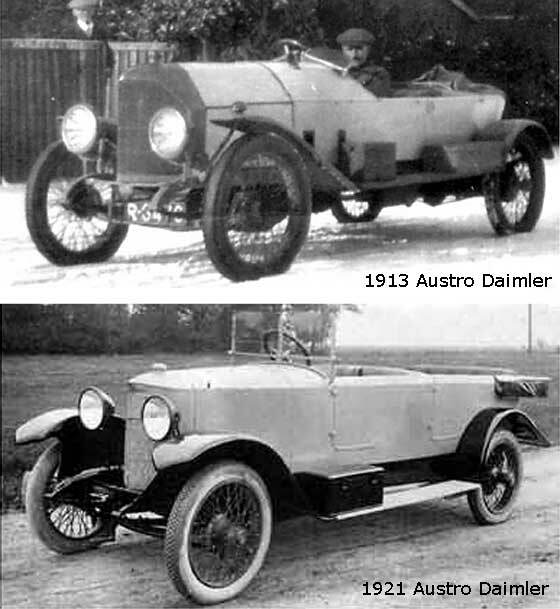 The first is showing Prince Axel in an open car and the other a Talbot. Our Bryan Goodman identified the first as a cca 1920 Marmon (poss. 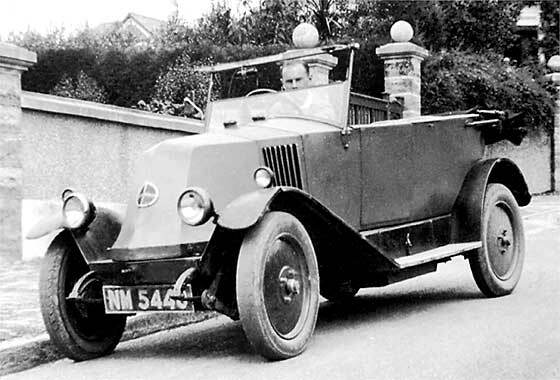 34a) and the Talbot as being French having wood spoked wheels (until about 1930), probably a cca 1926 Talbot (poss. DS 15/40). In England these cars were Darracq. One of two photos received from Peter Guyton (UK). 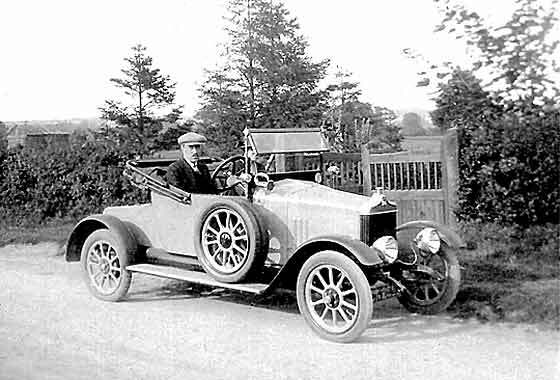 This one shows his great uncle Harold Hartley Wilberforce of York who appears to have been a keen motorist and who owned a number of cars. 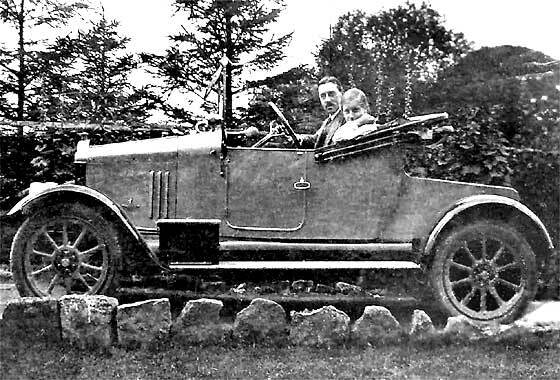 This is another photo of a car that we have identified previously as a cca 1921 Standard two-seater. This picture gives a full view from the other side. First Standard to be made in a batch of 1000 and became so popular that by 1928 when model was discontinued over 20,000 had been made. One of two photos received from Peter Guyton (UK). This one shows his great uncle Gerald Carr. Recognisable as a Bullnose Morris 1920-23, our Chas Moody was able to tell lots more from the lamps on the wings. These are the 'Three lamp set' with two medium lamps on the front wings and one rear light, and is a feature of the 1922/23 Morris Cowley. The car depicted appears to have a driver's door but this is sham, being formed by beading tacked in place to create the appearance of a door. One of two photos received from John Phillips (UK) which he found in an old photo album that belonged to his grandparents. Above the photo is written 1932, and is the second car they owned. The car they had previously in 1931 is the Chummy below. This car has the distinctive Renault 'scuttle bonnett' and has the circular Renault logo. The logo is in fact a grill behind which is located the horn. Registration NM 5440 was issued by Bedford County Council making this a 1925 Renault Torpedo. One of two photos received from John Phillips (UK) which he found in an old photo album that belonged to his grandparents. 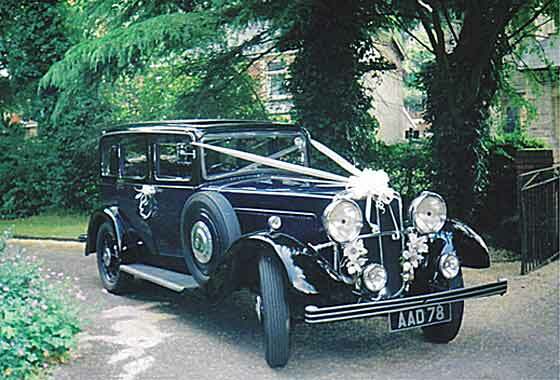 He had identified the car as a Austin 7 Chummy of 1928, but in case he is wrong, photo attached! He is quite right on the make and model but bulkhead mounted headlamps suggest earlier. We would say it is a cca 1925/6 Austin 7 "Chummy". The name came about because of the very 'chummy' tight interior that the four passengers had to squeeze into ! Photo received from Brian Legg (UK) asking for identification of the car based on a rear wheel ! From the people, Mrs Legg's grandparents John and Florence Law and mother Marjorie, who looks about 16 or so, it suggests that photo was taken in about 1929. Gramps was a Scotsman and Gran from Rothwell. We repaired photo and think this is the rear of a mid range commercial vehicle, a charabanc, of the late 1920s. Many makes were about, but suggestion is that this could have been Dennis. 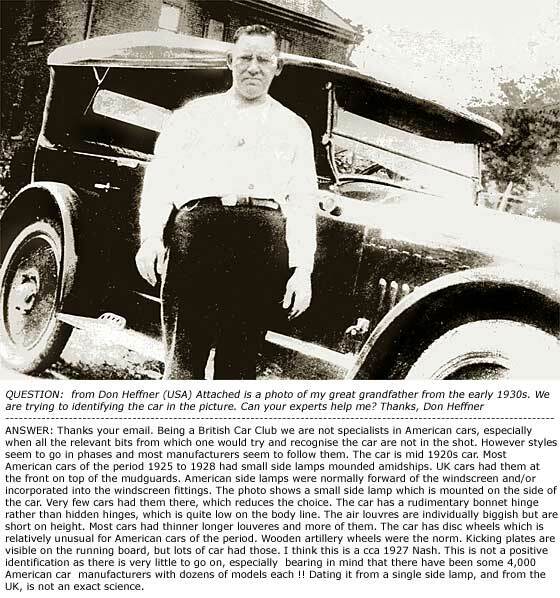 Part of a photo received from Don Heffner (USA) showing his great grandfather and believed taken in the early 1930. He is trying to identify the car and wondered if our experts can help. We are not much into American cars, especially when all the relevant bits are not in the shot. However, in view that the small side lamps are on the side of the car rather than below the windscreen, rudimentary bonnet hinge, bigish louvres, disc wheels, kicking plates etc, I think this is a cca 1927 Nash. Photo received from Sean MacKenna (UK) who is digitising the archive of the Dallmeyer Lens manufacturer and wanted to know the date of the works outing. 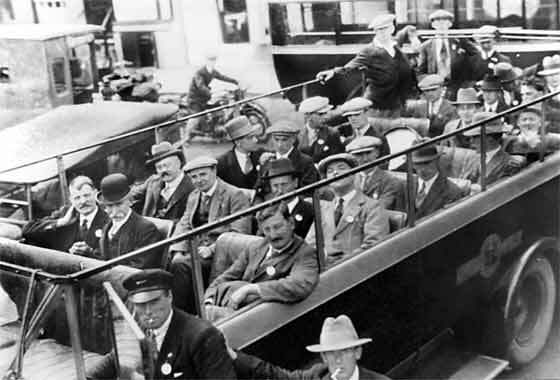 The top of the bus is convertible so charabanc era. The windows are glass operable by a central strap, in use in the mid/late1920's. The wheels are metal dished, in use by about 1927. Windows and solid roof busses were in use by very early 1930's. The bus looks 'new' so all the pointers suggest about 1930, or soon thereafter. 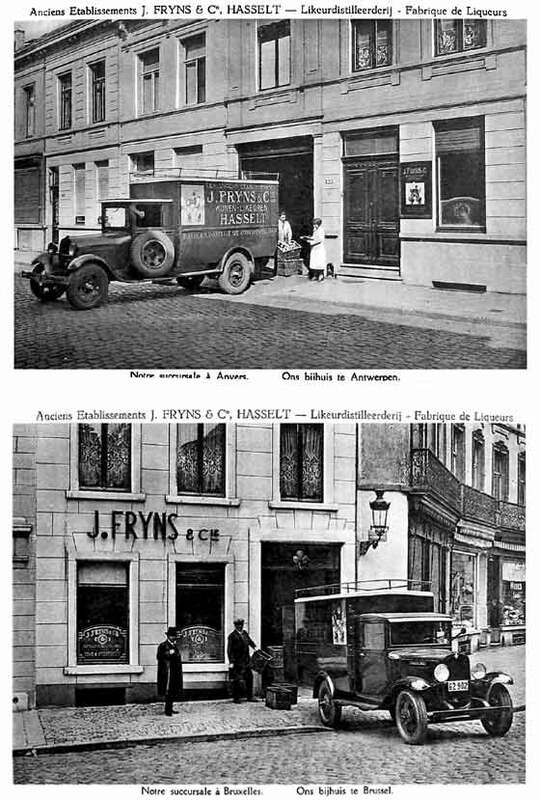 Two postcards received from Carl Van Houche (Belgium) showing delivery trucks with the J. Fryns & Cie livery. They were used by grand-grand father, a Gin manufacturer in Belgium, possibly in the mid 1920s. Although the Belgian FN Company made lorries of similar size, we feel that both are European Chevrolets. 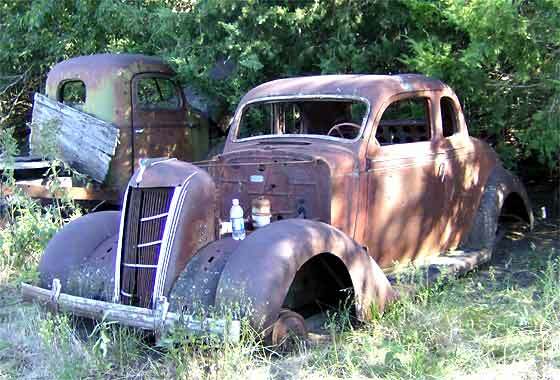 The top could be a cca 1929/30 Chevrolet and the bottom one a cca 1931/2 Chevrolet. It could even be one the first "British Bedfords" as there is a badge on the bonnet side. A photo received from Linzi Madusa (UK) writing on behalf of her father who has restored the 1934 MORRIS 25, to its former glory. Engine No 1091, Chassis 7433, first taxed on 24.9.1934. We can confirm that AAD78 is Gloucester County Council registration issued late 1934. Our Chas Moody advises that Morris 25 was produced between 1933-35. They were the most luxurious models of the Morris range. Few were made. For more, try the Morris Register (www.morrisregister.co.uk ). Another of the photos from Graham Hoadly (UK) showing part of the Australian branch of the family. 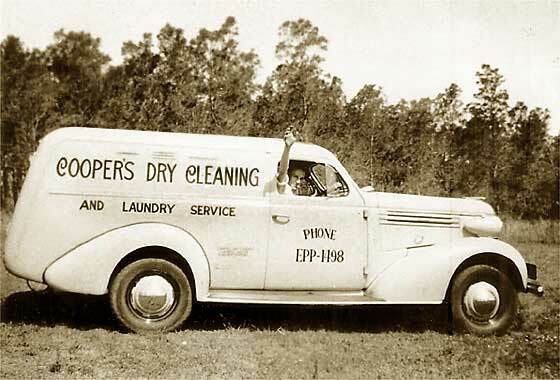 GG Uncle Arthur Ebenezer Cooper and all his family were glove dyers and cleaners, also for the Court apparently. 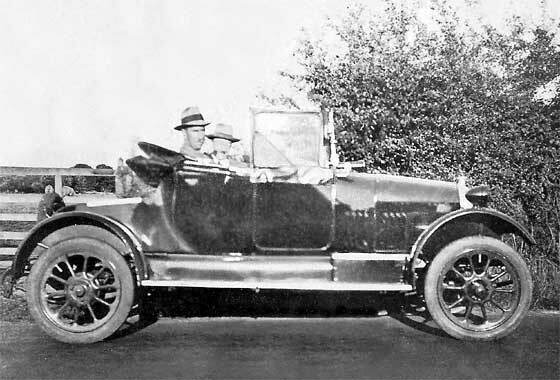 He and his family emigrated to Australia about 1914 and his son continued the business; photo is of his van in Australia. Chrysler was beginning 'badge engineering' at the time, Dodge /Plymouth/De Soto, but we think this is a cca 1935 Chrysler Van, as per Coupe below. A photo received from J P Lott (USA). " I am writing in regards to having trouble identifying my vehicle. I believe it is a 1936, but all of the styling cues and hood ornament are closest to a 1936 dodge. The problem is I have no vin, no title, or anything to give me a clue, this car was basically free, but is there any way you can point me in a direction to figure out what this is?". We are not specialist on American cars but, from same family, probably the coupe version of the 1935 Chrysler C5. Unusual enquiry from Ian A. (UK?) 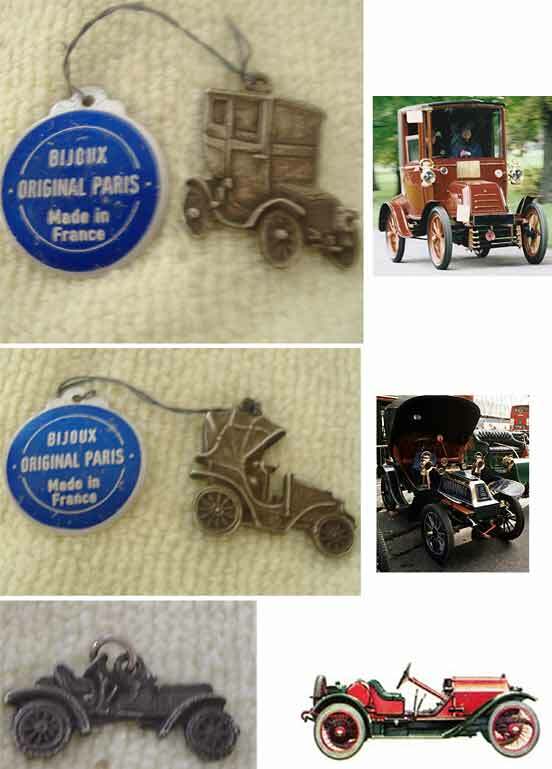 who stated: " I have recently got some old French charms of vintage cars but can find no information on them. I was hoping you could help me in identifying the models of these cars." We are not into jewelry but automobile charms are widely available and only indicative of the car. Guess the car with hard top is a Georges Richard cca 1903, one with soft top is a De Dion Bouton cca 1903, and open top car is of a much later, being Stutz Bearcat cca 1913. 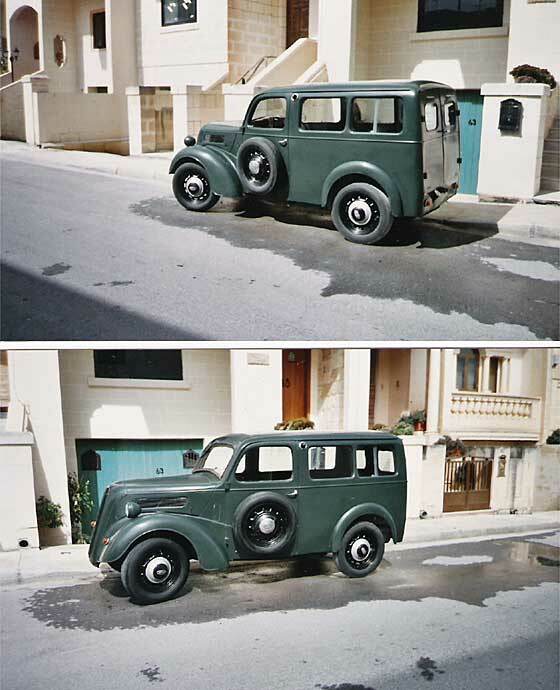 Photo received from Sammy Buhagiar but we do not know the country or anything about the car apart from that it is a Ford Fordson 5cwt estate, manufactured in 1949. We have already done a detailed item on Martin Walter and their conversions which tells about the history of the company. In the UK this van was called a 'Thames 5cwt' so name 'Fordson' suggests the Commonwealth. Visit to an interesting site on Ford vans, including Martin Walter conversions will explain much more.